The paper highlights the role harassment plays in forcing tenants out of their neighborhoods and strongly pushes back on the City’s stance that rezonings do not cause displacement. Countering this narrative is especially important in a low-income community of color like the Southwest Bronx, where the history of race, class and displacement cannot – and must not – be ignored. 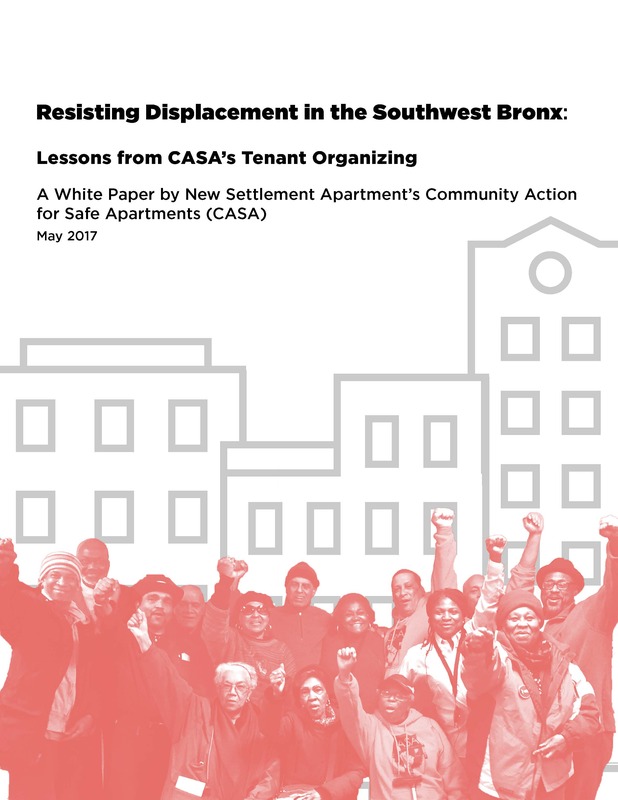 CASA outlines some of the tactics landlords use to push out their tenants, including the denial of services and repairs, using loopholes in the law to raise rents through Major Capital Improvements, non-rent fees, preferential rents, and bringing frivolous cases to Housing Court. If the proposed Jerome Avenue rezoning goes through – significantly increasing existing land value – the incentive to displace tenants as a way to increase profits will be even greater. Unfortunately, the City’s proposed mitigations for this – the creation of affordable housing through Mandatory Inclusionary Housing and existing subsidy programs – are not sufficient, as the units created are at income levels beyond the reach of most neighborhood residents and cannot make up for the loss of existing homes. This is why CASA is calling for new solutions to fight displacement before any rezoning moves forward. The proposals include creating an affordable housing subsidy program that truly matches the neighborhood’s need and a package of strong tenant protection measures such as Right to Counsel and a city-wide Certificate of No Harassment (CONH) program. 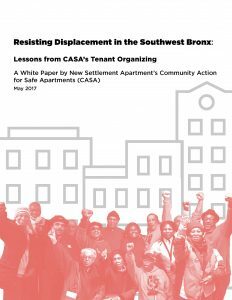 In laying out the reality and dangers of displacement in the Southwest Bronx, the paper makes the crucial point that the experience and voice of neighborhood residents on this issue cannot be ignored or glossed over. These tenants are not speaking up against a rezoning because they are uninformed, misinformed, reactionary or simply afraid of change. They are speaking up because they are experts in what is happening in their neighborhood. They know best about the reality of displacement and the threat it poses to their community. They know best what solutions must be in place to create a new path forward. “The other possibility, the one we fight for, is that this will prove to be a rezoning for low-income tenants of color. That the rezoning will be buttressed by so many anti-displacement policies that it will be something different: investment that corrects the past wrongs of our City’s developers and policy makers and creates a new path forward of development without displacement. If we cannot figure out how to bring investment in the Southwest Bronx without displacing thousands of tenants, without repeating our past, then we can’t do it anywhere.